Karl-Gunnar Olsson is professor in Architecture and Engineering at the Department of Architecture at Chalmers University of Technology in Gothenburg. His research is mainly aimed at development of concepts and forms for representation of engineering systems in the building design process. This includes the interaction between architects and engineers as well as the dialogue and the digital tools needed in early design phases, and range from architectural conservation to design of new buildings. Central is the formulation of theoretical concepts that support conceptual understanding of mechanical systems, such as the concept of canonical stiffness. Karl-Gunnar Olsson is also responsible for the dual degree, Master of Architecture (MArch) and MSc in Engineering, programme Architecture and Engineering at Chalmers. 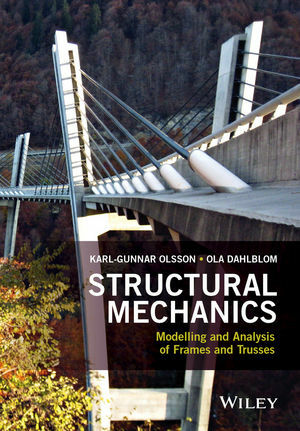 Ola Dahlblom is professor in Structural Mechanics at Lund University. His main area of research is material mechanics with development of computational models for materials with complex internal structure. Examples of applications are the behaviour of concrete during hardening and the shape change of sawn timber during drying. An important part of this work is the development of computer code for simulation and visualisation of the structural behaviour. He has in recent years also been a driving force behind renewal of literature and development of computer programs for teaching structural mechanics in the Bachelor of Science and Master of Science educations.